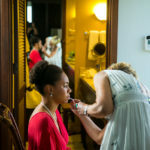 This couple was married in Hawaii at the Mauna Lani Resort and Spa. They were married on the beach at a place called the sand court. A beautiful ceremony that ended with a reception overlooking the sunset.